Visit the OrganiGram Investor Dashboard and stay up to date with data-driven, fact based due diligence for active traders and investors. MONCTON, NB, April 15, 2019 /CNW/ – Organigram Holdings Inc. (TSX VENTURE: OGI) (OTCQX: OGRMF), the parent company of Organigram Inc. (the “Company” or “Organigram”), a leading licensed producer of cannabis, is pleased to announce its results for the second quarter ended February 28, 2019 (“Q2” or “Q2 2019”). The Q2 2019 includes the first full quarter of adult-use recreational sales for the Company. We executed very well again this quarter and have established Organigram as one of the leaders in the Canadian adult-use recreational market. For the second consecutive quarter, our results reflected operational excellence which translated into record revenue for the Company, industry-leading adjusted gross margin, and positive adjusted EBITDA, all of which differentiates us from most of the Canadian industry today. Our team has already progressed several key initiatives in preparation for the derivative and edibles launch in the fall of 2019. We are excited about the significant growth ahead expected from these new products, our expanding capacity, our strategic partnerships, and our relentless focus on continuous improvement to consistently deliver high quality product to our customers. Q2-2019 gross revenue of $33.5 million and net revenue of $26.9 million (less excise taxes) increased exponentially from the same prior year period (Q2-2018) as Q2 2019 included the first full quarter of adult-use recreational sales. Cash cost of cultivation of $0.65 and “all-in” cost of cultivation of $0.85 (including non-cash depreciation and share-based compensation) per gram of dried flower harvested3 decreased from $1.24 and $1.48, respectively, in Q2-2018 largely due to higher yields per plant. Adjusted gross margin (a non-IFRS measure that excludes the effects of fair value adjustments on biological assets and inventories) increased to $16.0 million or 60% (of net revenue) from $1.8 million or 52% (of net revenue) in Q2 2018 as explained by increased unit volume sales. Q2-2019 reported gross margin (includes fair value adjustments on biological assets and changes in inventory) equalled $8.0 million compared to $6.2 million in Q2-2018. Adjusted EBITDA of $13.3 million or 49% (of net revenue) was positive for the third consecutive quarter and increased from adjusted EBITDA loss of $0.3 million in Q2-2018 driven by exponentially higher unit sales. Sales and marketing and general and administrative (“SG&A”) expenses were $5.7 million (excluding non-cash share-based compensation), up from $2.7 million in Q2-2018. As a percentage of net revenue, SG&A expenses excluding share-based compensation decreased to 21% from 79% in Q2-2018 as management continued with their disciplined approach to overhead spending during this high growth period. 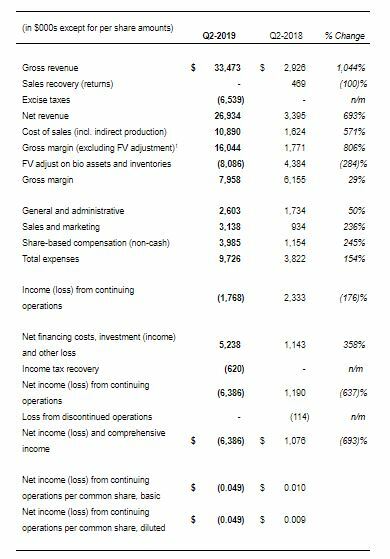 Net loss from continuing operations of $6.4 million or $(0.05) per share on a diluted basis, compared to $1.2 million net income, or $0.01 per share on a diluted basis in Q2-2018. a multi-year extraction agreement with Valens GroWorks Corporation (“Valens”) to extract cannabis from Organigram’s Moncton operation and hemp purchased from 1812 Hemp4, to produce extract concentrate for oil production and build up inventory of concentrate in advance of the expected launch of derivative based products this fall. Subsequent to quarter end, the Company’s remaining convertible debentures at a carrying value of $49.3 million(approximately $53.7 million of face value as at February 28, 2019) were either voluntarily converted by holders or force converted at a conversion price of $5.42 by the Company as at April 1, 2019 resulting in an issuance of approximately 9.9 million common shares of the Company. The conversion of the debentures has removed the $49.3 million liability from the balance sheet and eliminated a 6% cash coupon payment to the previous maturity of January 31, 2020. The Phase 4 expansion of the Moncton facility will add 92 incremental grow rooms in stages and construction is anticipated to be complete by the end of calendar 2019. Additional grow rooms are expected to more than triple current production capacity to 113,000 kg per year5 from 36,000 kg/yr, once it is complete. The Company submitted an amendment to its license to Health Canada for the entire perimeter of Phase 4a and Phase 4b as well as for 13 of the Phase 4a grow rooms in March 2019. In anticipation of receiving licensing, the Company has already begun cloning for these initial 13 rooms. As per previous Phases of expansion, the Company will stagger the licensing amendment submissions and initial use of the remaining rooms to coincide with its production schedule. The expected capital cost for the entire Phase 4 remains unchanged from Q1-2019 at approximately $125 million5 and Organigram spent $27 million on this Phase in Q2-2019. The Company owns an additional 56,000 square feet within its existing facility which became available for its use in March 2019 and is currently being refurbished and designed under European Union GMP standards for additional extraction capacity, its own derivatives and edibles facility and additional office space. Organigram expects primary construction on Phase 5 to be substantially complete by October 2019. The initial capital cost estimate is approximately $48 million5. The Company believes it is well-positioned for the derivatives launch in the fall of 2019. Organigram is expanding capacity with the Phase 4 and Phase 5 expansions of its Moncton facility as well as the extraction agreement with Valens. Organigram has an exclusive consulting agreement with TGS International LLC, a vertically integrated cannabis company and proven market leader in Colorado6, to better understand demand for certain derivative-based products, market share trends over time and for the development of commercial scale extraction and product development and processing. The Company is currently focusing its interests on vaporizable pen technologies and a selection of edible products. A chocolate molding line and additional fully automated packaging equipment for product lines such as edibles and other derivative based products have been ordered and short path distillation equipment for edibles and vape pens has been purchased. Organigram believes it has also developed a shelf stable, water-soluble and tasteless cannabinoid nano-emulsion formulation that provides an initial onset within 10 to 15 minutes if used in a beverage. Non-cannabis formulations with a similar molecule size are water-soluble in humans (i.e., absorbed through the bloodstream rather than requiring first-pass liver metabolism, which results in longer onset and duration). The Company expects to receive appropriate research and development licensing in the very near future at which point it will be able to confirm the onset of action and duration of effect. At this point, the Company is not planning to launch its own cannabinoid infused beverages and is actively seeking a strategic partner with proven experience in beverage product development. 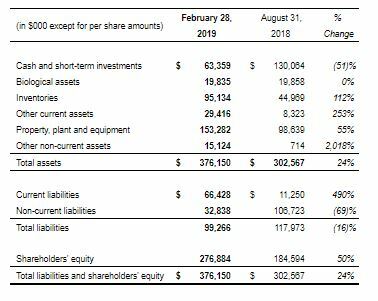 As of February 28, 2019, Organigram has approximately $63.4 million in cash and short-term investments and a low debt to adjusted EBITDA ratio at quarter-end and also generated positive adjusted EBITDA (a non-IFRS measure) in the last three reported quarters. On April 1, 2019, the Company converted the principal amount outstanding of the remaining debentures and eliminated a $49.3 million current liability from its balance sheet. Subsequent to quarter-end, Organigram signed an indicative term sheet with a Canadian Schedule 1 chartered bank, as arranger and lead lender and, subject to the completion of due diligence and definitive loan documentation, expects to receive debt financing in the aggregate amount of approximately $140 million, which would include both a term loan to finance the Company’s ongoing expansion plans and revolving debt for general working capital and corporate purposes. During the quarter, approximately $44.4 million of face value of debentures were converted into common shares of the Company at a conversion price of $5.42, leaving approximately $53.7 million of the face value of debentures outstanding. 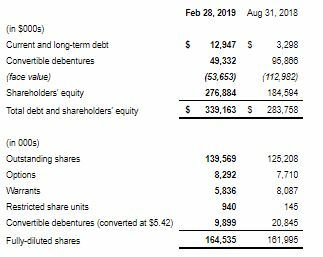 Subsequent to quarter-end, the remaining face value of debentures outstanding were converted into common shares at a conversion price of $5.42 per share, leaving $nil face value of debentures outstanding. A telephone replay of this conference call will be available shortly after the call’s completion until April 22nd, 2019. To access the recording, use the following dial-in number 1-855-859-2056 and conference ID 1387326. 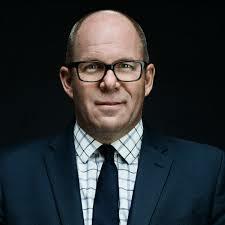 A replay of the webcast will be available at the conclusion of the call at the aforementioned webcast link and on the Company’s investor relations website at https://www.organigram.ca/investors/ and will be archived for a period of 90 days following the call. Organigram is focused on producing the highest-quality, indoor-grown cannabis for patients and adult recreational consumers in Canada, as well as developing international business partnerships to extend the company’s global footprint. Organigram has also developed a portfolio of adult use recreational cannabis brands including The Edison Cannabis Company, Ankr Organics, Trailer Park Buds and Trailblazer. Organigram’s primary facility is located in Moncton, New Brunswick and the Company is regulated by the Cannabis Act (Canada) and the Cannabis Regulations (Canada). ¹Adjusted gross margin and adjusted EBITDA are non-IFRS measures that are not defined by and do not have any standardized meaning under IFRS; please see the Company’s Q2 2019 Management’s Discussion and Analysis (“MD&A”) for definitions and calculations. The Company adjusted the calculation of adjusted EBITDA in Q2 2019 to add back share-based compensation per the Company’s Q2 2019 Condensed Consolidated Interim Statement of Cash Flows. Using this new methodology, the Q1 2019 adjusted EBITDA would equal 55% compared to 40% under the old methodology. ²Financial figures relating to 2018 have been restated due to the reclassification of discontinued operations and the reclassification of shipping expense from selling and marketing expense to cost of sales. ³Cash cost of cultivation per gram of dried flower harvested is a non-IFRS measure that are not defined by and does not have any standardized meaning under IFRS; please see the Company’s Q2 2019 MD&A for definitions and calculations. Cash cost of cultivation excludes significant post-harvest costs including but not limited to extraction, packaging and shipping which need to be added to arrive at cost of sales when inventory is sold. 5The forward-looking estimates of additional production capacity and costs related thereto are based on a number of material factors and assumptions. Please see the Company’s Q2 2019 MD&A. 6The Company has no investment or ownership in any entity in the United States nor does it provide any products or services to entities in the United States. 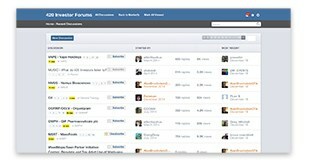 The most reliable, fact-based information on Organigram found only on its Investor Dashboard.